The Rowing Rams travelled to the Huron River in Ann Arbor on Saturday, April 13, for the annual Floodtown Regatta. The event is hosted by Skyline High School and provides tough competition from ten teams including Huron, Saline, Northville, Perrysburg, Culver, Pioneer, and others. The Floodtown race is unique in style. 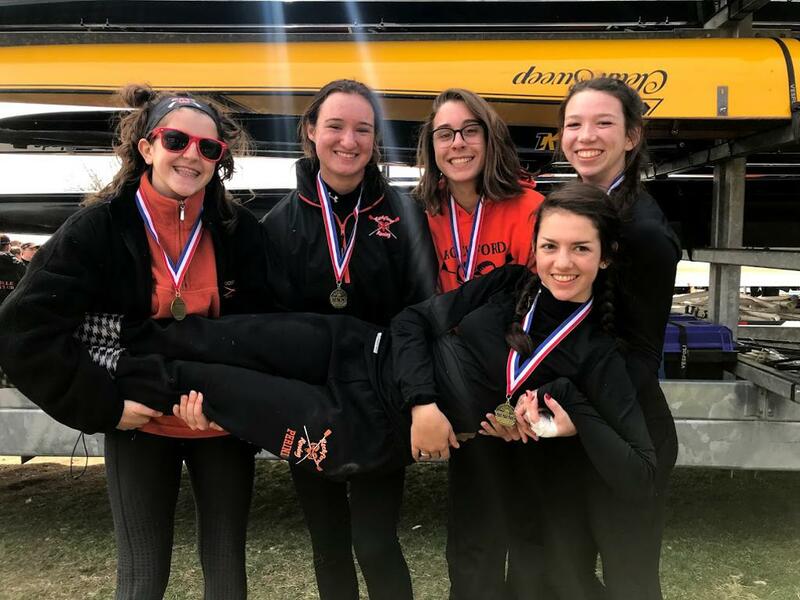 Typically, rowers will compete 1,500 meters in a straight line while this event features three challenging turns along the legs of the Huron River, which offers a challenging opportunity for Rockford in their first outdoor event of the season. Many of the Novice (first year rowers) were looking forward to demonstrating the hard work they have been putting in with the kick-off of the spring season. Unfortunately, due to the high winds of the day, many of the events needed to be cancelled. With the scratched events due to weather, the regatta was only able to award gold medals for the remaining races. 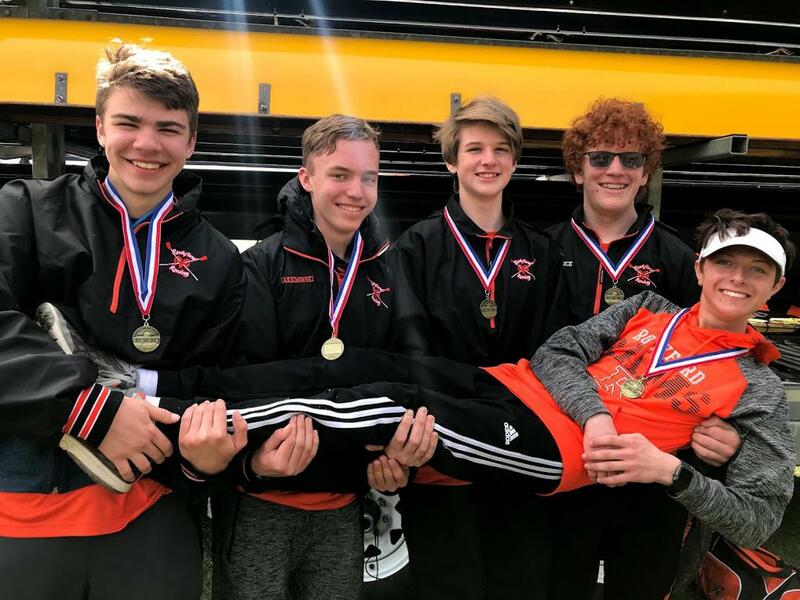 The Men’s Novice 4+ boat took gold and included athletes Conner Wolownik, Ty Maksimowski, Shane Johnson, Cole Rice, and Remington Bertelsen as coxswain. The Women’s Women’s Lightweight 4+ boat also took gold featuring Amelia Sundman, Chloe Merritt, Ally Kinstle, Sophia Stauffer, and Callie Perini as coxswain. Many other boats also earned top three finishes. Head woman’s coach Dilan Itter congratulated the team for a job well done. The weather offered an opportunity for rowing in unique conditions. The coaches are confident that the team will get faster with the hard work they are putting that work in. They see the work ahead of them and just have to make sure they are putting the work in day in and day out and keeping the focus. 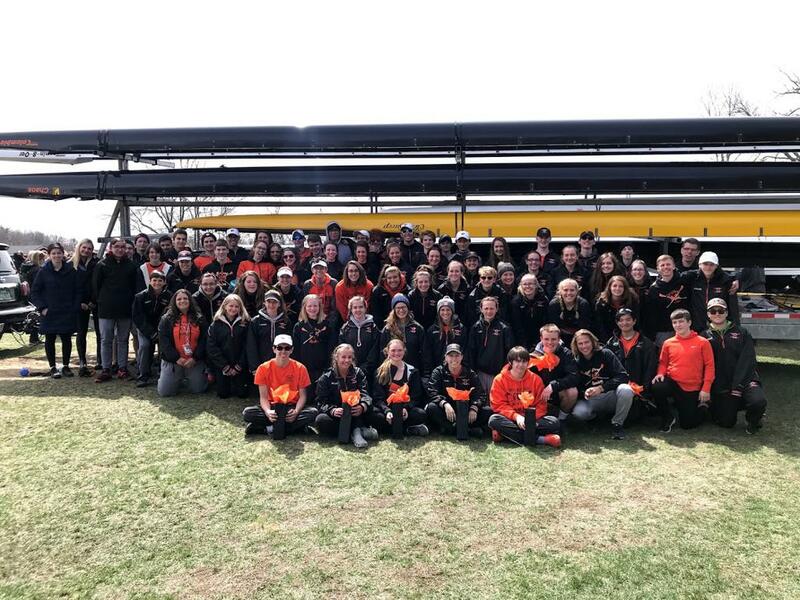 The next regatta for Rockford Rowing will be the 24th Annual Grand Rapids High School Rowing Invitational, Saturday, April 27, in Grand Rapids. To learn more about the program, visit RockfordRowing.com.